I moved to the Texas Panhandle during summer 2008. At the top of my list of “things to photograph now that I’m living in the Panhandle” was the horned toad (a.k.a. horny toad, horned lizard, and horned frog). While growing up my dad saw them on occasion, and he’d come home and tell us about them; however, I had never seen one for myself. I thought that I’d have to wait awhile to fulfill my “goal.” Never in a million years would I have bet money on seeing a horned toad during my first trip to Palo Duro Canyon State Park. But I did — and it was nothing short of awesome — almost like God put this little horned toad on the trail just for me to see! In the nearly-eight-years that I’ve lived here, I’ve only seen horned toads two other times. 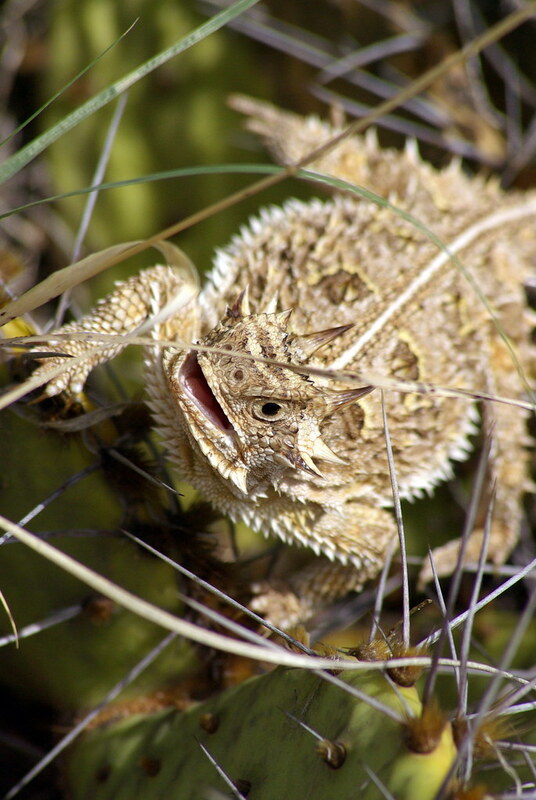 In 1993, the Texas Horned Lizard was declared the state reptile of Texas. Three types of horned toads call Texas “home;” they vary in length from 3 to 6 inches. Horned toads are listed as a threatened species in the state of Texas because their population has declined sharply over its historical geographical range. If you see one, please leave it alone! Other pictures that I’ve taken at Palo Duro Canyon can be seen on my Flickr page.